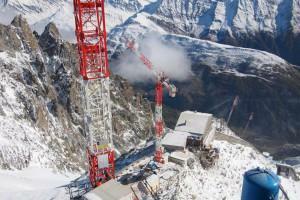 A pair of tower cranes was erected last autumn to help build the upper station of the world’s most expensive cableway at Pointe Helbronner at 3,462 metres above sea level. In addition a huge terrace was cut in the rocky eastern side of the ridge to park a couple of powerful bulldozers. The Cordée Mont Blanc group which won the contract to build the new cableway, needed to hire Super Puma and a Russian-made Kamov helicopter to do the job at the hefty flying price of respectively €110 and €140 a minute. The new, large-scale project, which includes much more than the cableway, will require an investment of €110 million and at least five years of work. It involves a complete reconstruction of the three sections and the stations. But if we remain mobilised we can still change the course of of action. From the lower station in Entrêves the rotating cablecars will carry more than 300,000 people a year; a fourfold increase in visitor numbers. At the upper station a spectacular new high tech building will replace the existing structures and will include : a circular 14-meter diameter scenic terrace (offering tourists a 360 degree view of the Mont Blanc summit (4810 m), the Dent du Géant, Grandes Jorasses and the Vallée Blanche), a large panoramic dome equipped with a multimedia information system, restaurants, a café and easy access to the glacier. To stabilize the new station a concrete pillar will be anchored 80 meters deep in the granite, this hole will also be used to install an escalator for direct access to the Torino hut. 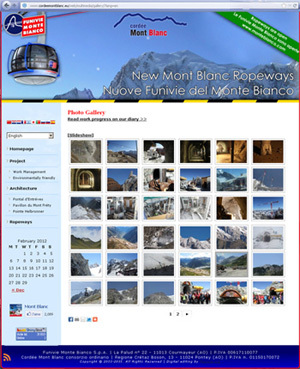 Once again environmentalists are expressing their deep concern for the significant increase in the anthropogenic pressure to be borne by the Mont-Blanc range, should this project materialize as planned, and they warn of the consequences of bringing such a massive amount of metal and concrete into this already heavily compromised area. One Response to "News from « Pointe Helbronner »"